Super-villains beware! We've discovered new ways to process polyester fibers to create an Adult Deluxe Vision Avengers 2 Costume that not only looks amazing, but also may or may not grant all of the powers of the Solar Jewel and synthetic materials that make up the body of the core member of the Avengers. 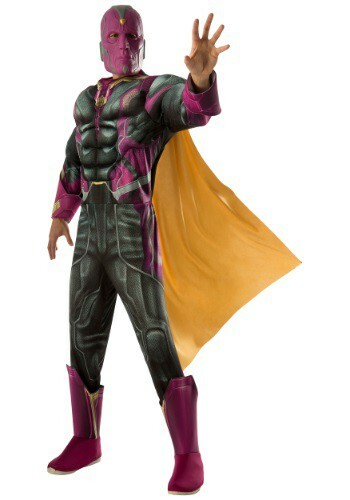 No hulking Bruce Banner will be able to touch you when you have acquired the powers possibly granted by this costume. No Hawkeye will be able to see (or shoot) you. There is zero chance that your friend Mark who dressed up as Iron Man will be able to shut down your programs due to the quality instilled in the very fibers of this costume. Not only will the Scarlet Witch want to marry you immediately, even Black Widow will come knocking at your door, having been so impressed with the tales of your heroism. This Adult Deluxe Vision Avengers 2 Costume includes all the parts that make Vision not only the best Avenger, but also the only good android ever in comics. The jumpsuit fastens with Velcro at the back and the cape easily attaches or detaches from the shoulders by means of the same Velcro technology. Foam Gauntlets are sewn onto the sleeve cuffs and the foam boot covers attached to the pants easily slip over any footwear. The molded plastic mask is secured by an elastic band, which keeps the mask on your face in even the toughest fights with Ultron.